– Drastically improve your fish catching success! QDX is absolutely perfect for trolling live/dead bait lures and can be fished from Outriggers, Downriggers, Kites or the Flatline position. QDX has fully adjustable tension and works like any other high quality release clip. 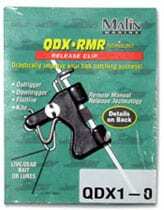 What makes the QDX Outrigger Release so unique is Malin’s Remote Manual Release technology (RMR). RMR allows you to manually release the fishing line from the clip by pulling the outrigger halyard until the QDX hits the top, causing the release arm to open. 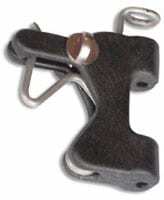 All other clips require tension on the fishing line to pull their release arm open. Example.. say you’re trolling live bait from the outrigger and you get a strike, you allow time for the fish to get the bait in its mouth prior to setting the hook. Using RMR you can release the fishing line from the clip prior to setting the hook. By releasing the line from the clip, you eliminate slack line, ensuring a proper hook set. With other release clips the weight of the fish must exceed the tension setting before the line is free. This means, at the precise moment you need tight line there will slack line created when the line is released from the clip. You must quickly remove the slack line before the hook sets. Many fish have won freedom during this brief moment. Using the RMR technology feature of the QDX Outrigger Release, this slack line problem is completely eliminated. Another example… say you’re trolling and notice a splash or strike near your bait or lure, but the fish didn’t hook up. For a second chance at the missed opportunity, you should quickly place your reel in free spool, this stops the bait dead in it’s tracks. Then use RMR to release the line from the QDX Outrigger release. Quite often the fish thinks it has killed the bait and returns for an easy meal, you will be ready for the hook set.